A Magnetic storm is a temporary geomagnetic disturbance occurred in the Earth’s magnetosphere. It is the prime physical processes of the magnetospheric space weather. Ring Current (RC), an electric current carried by charged particles trapped in a planet's magnetosphere, is recognized as the key issue in the study of magnetic storm. Existing at geocentric distances from 2 to 9 Earth radius, RC was caused not only by the gyromotion, but also by the gradient and curvature drifts of the trapped, energetic particles, ranging from ~1 keV to a few hundreds keV. When strong magnetic storms occur, a large amount of particles are injected into the RC region, which will considerably enhance the RC intensity and thereby cause a strong disturbance in the geomagnetic field. Recently, based on the newly developed Cluster multi-point analysis methods, Prof. SHEN Chao and Dr. YANG Yanyan from the State Key Lab. 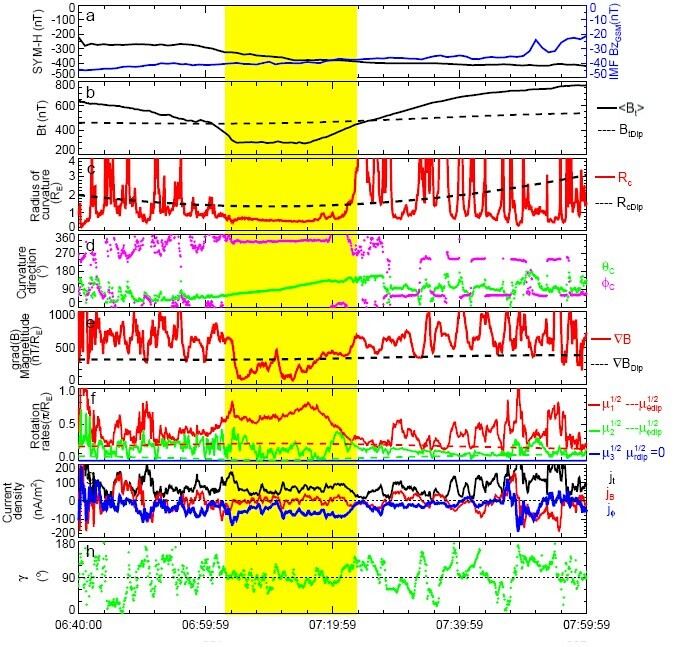 of Space Weather, the National Space Science Center (NSSC) revealed the variations of the local current density distribution and magnetic configuration of the RC during magnetic storms. The research group managed to provide direct and solid evidence concerning the existence of an inner, eastward flowing current in addition to the dominant westward current in the ring plane. It has also been testified that the ring current itself can distort the topology of geomagnetic field significantly during magnetic storms. The curvature radius of the Magnetic Field Lines (MFLs) sharply declines at all local times when the intensity of the storm activities increases. To be noted, the curvature radius of MFLs in the RC region during the severe storm periods can be as small as one third of that during the quiet time. It is also noteworthy that during storm activities, the radius of curvature of the local MFLs, is the smallest on the nightside to duskside, medium on the dawnside, and the largest on the dayside. Such change of the geomagnetic field in geometry during storms may exert significant influences on the particle dynamics in the plasma sphere, ring current, and radiation belts. Firstly, magnetic configuration variation will cause the redistribution of various energies in these region; secondly, the significant magnetic strength decrease near the equator may lead to the violation of the first adiabatic invariant of the previously existed energetic ions, leading to pitch angle scattering; thirdly, since the disturbance magnetic field produced by the strong ring current is comparable to the local geomagnetic field, we therefore suggest that the storm DPS relation should be modified. This research result entitled Direct calculation of the ring current distribution and magnetic structure seen by Cluster during geomagnetic storms was published on the Journal of Geophysical Research (JGR): Space Physics. Volume 119, Issue 4, pages 2458–2465, April 2014. DOI: 10.1002/2013JA019460.